Jennifer Cluff: Best right thumb position on the flute? What is the best possible right thumb position on the flute? After teaching for over twenty years, I firmly believe there is no single "best place" for the thumb, as every flute player has completely different hand shapes and finger/palm lengths. 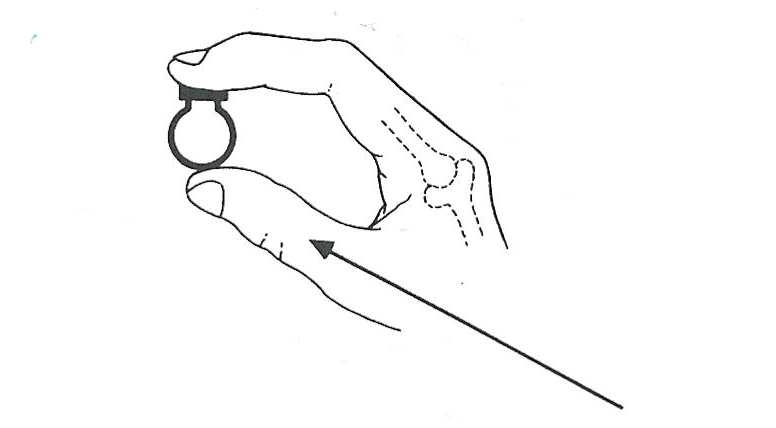 - distance of placement of thumb joint on palm. Therefore, there are multiple possible placements for the right thumb depending on the above factors. Indeed, some players play on the tip of the thumb, side of the thumb, with thumb pointing up the body toward the headjoint, with thumb bent backwards into a J-shape, etc. etc. All thumb positions in players who play for more than four hours a day are in fact reached by the hand adapting over time to faster and faster technique. So be willing to accept that the thumb position will adapt over time as well. 1. Place slightly curved fingers on the right hand (F, E, and D) keys, but leave the thumb *off* the flute. Notice where the thumb might meet the body of the tube if these three fingers are comfortable, natural, and in the best position for rapid movement. 3. Observe the right wrist to be sure it is not cocked backward (see www.jennifercluff.com/lineup.htm for more details). You need the right arm to be as natural as possible; as if picking up a book on a mantlepiece or lying sideways on a shelf at shoulder-height. 5. Lastly move footjoint to a position so Eb key is under a slightly curved pinky. Again, hands vary tremendously between flute players. The spectrum is enormous. 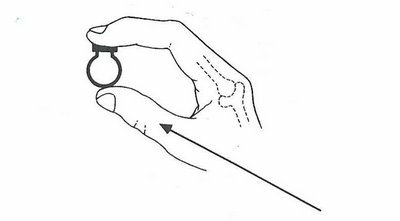 Ideally the thumb should be placed so that the fulcrum of the finger motion in the right hand is easy and natural as shown in the attached illustration from Michel Debost's book "The Simple Flute". 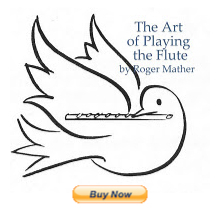 But owning the Debost book "The Simple Flute from A to Z" is a good investment, and will help solve countless problems, and answer many many questions. You are quite right: Michel Debost's 'The Simple Flute' is an inspirational book. Many thanks both for your excellent website in general, and in this instance for suggesting (last December) that we all looked on the web at the pages from this book. I'm sure I'm not alone in almost immediately ordering a copy. Even though he says it is not intended to be a book you read from cover to cover, but one to dip into, it is so fascinating I invariably find myself following the links at the end of each section.To anyone who hasn't yet bought it, be warned: once picked up it's very hard to put down! John Krell's 'Kincadiana' - very very short book, but the illustrations say so much. A bit zen-like, even. Angelita Floyd's 'The Gilbert Legacy'. Super clear explanations of flute techniques; dynamics, staccato etc. I'll go see if google books has either of these. Thanks for this post. As a flutist with quite a severe hitchhikers thumb, I've always been a little self-conscious about how I hold my flute. This post seems to suggest that it should be okay as long as the other fingers on my right hand are comfortable and move easily and naturally-which they do. It may look funny, but I'm relieved to learn that I'm not the only flutist with an unusual thumb position. Could you post a photo of your "hitchhikder's thumb"? I'd like to see what you're talking about exactly. Thanks, J.
I find your blog to be very useful for myself as a player as well as a teacher. I have an adult student who has moved to an open hole flute and is struggling more than usual with the right hand ring finger. She has a naturally long and curved thumb. When she relaxes her hand at her side, the thumb still curves. My bigger concern is still the ring find though. At rest, her first, second and third fingers are very close together, then there is a large gap between the ring finger and her pinky. I'm looking to see if I can find a good position for her that will promote facility through the low notes but still be able to cover that hole. To further complicate, she has developed some arthritis in her middle finger on that hand. Do you have any thoughts on what I could have her try to improve this? I too have very long fingers, and a curved right thumb. - rotate the footjoint inward a small amount, so that the pinky easily lands on the B and C keys without any change in hand position. This allows the pinky to be naturally curved on the Eb lever too. Works really well. This has been my solution for 20 years. I really don't agree with the idea that open-holes MUST be closed with finger tips if this has proved to be wrong for the individual hand. Hope you agree and try this with your student, then send feedback and let me know if it solves the problem. I have had two students with previously broken right hand fingers who needed to plug holes and rotate footjoint inward as well. If they can do it, why can't a player who simply cannot cover open-hole due to natural hand shape variations also do so? I often think we're caught up in pedagogy that has no useful purpose. Afterall, many profoundly good flute players existed who did not have open-hole, or prior to the invention of open-holes.